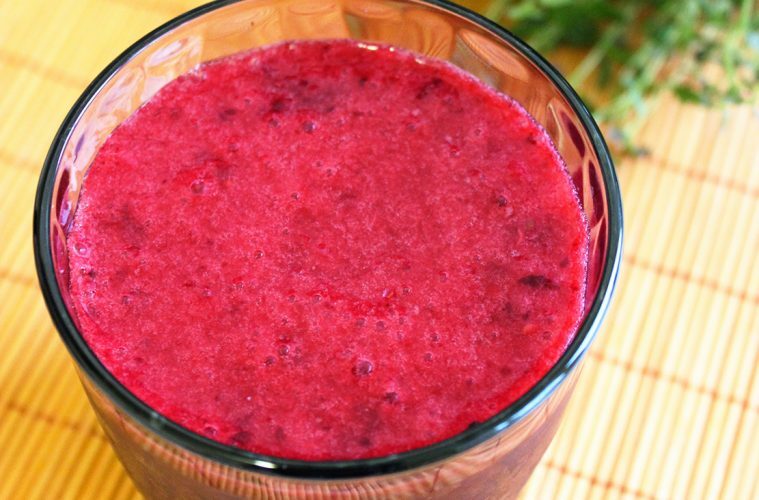 Trust me, this Super Berry Mango Smoothie makes a fantastic morning start! Secure 2 portions of your 5-a-day with this healthy smoothie recipe. Berries are rich in antioxidants and vitamins ( you can never have enough, especially in cold seasons), mango’s are generous in vitamin A and C, help clear the skin and add a rich and sweet texture. Almond milk is made with a super food that boosts the healthy-benefits and makes this smoothie completely dairy-free. You can use store-bought almond milk, but if you have time to make your own homemade version is even better. You can add a little honey to enhance the sweet side, otherwise keep it simple, natural and totally vegan. Add chopped mango and berries into a blender. Pulse for 10 seconds. Gently incorporate almond milk, while pulsing, until reached desired texture.